You are here: Home › General › Cool new gear: Ampeg GVT series all tube guitar amplifiers. The new AMP GVT series amplifiers. 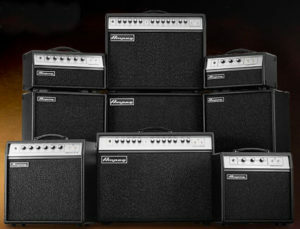 Ampeg are back in the guitar amplifier business, with a new range of all-tube amps, the GVT series. The GVT series have a distinctly vintage 70s vibe, and come in a range of sizes and specifications. Models include the GVT52-112 and 212 combos, GVT15-112 and 15H combo and head, GVT5-110 and 5H combo and head, and GVT112EW and GVT112E cabinets. Ampeg today re-enters the world of premium guitar amplification with the announcement of the GVT series guitar amps, due out this summer. Each head, cab and combo offers all-tube guitar tone in a sleek design inspired by classic Ampeg guitar amps from the ‘70s. The comprehensive line of Ampeg GVT Guitar Amps range from an ultra-compact 5-watt head, all the way up to a gig-friendly 50-watt, 2×12 combo. GVT heads and combos are all-tube by design, including 6V6 and 6L6 power tubes for unmistakable American feel and tone. The tonal palette is wide, featuring Ampeg’s legendary Baxandall EQ circuitry, which provides unmatched flexibility, allowing the guitarist a much wider range of tones than competitive amps. Both GVT extension cabinets feature Celestion® Vintage 30 speakers, while GVT combos use Celestion Original Series speaker designs, perfect for translating the feel of the all-tube GVT amplifiers. Plus, rugged build quality ensure years of use out on the road. Available later this summer, the Ampeg GVT Series will launch with eight different models: the GVT5H and GVT15H heads, GVT112E and GVT112EW cabinets, plus the GVT5-110, GVT15-112, GVT52-112 and GVT52-212 combos. Ampeg GVT pricing is TBD at this time. There are some nice samples on the Ampeg site, showing a wide-range of different tones that can be achieved with the GVT series. It’s great to see a big range of models too, with the bedroom friendly 5W models, though to the 50watt monsters. These are sure to be very popular.